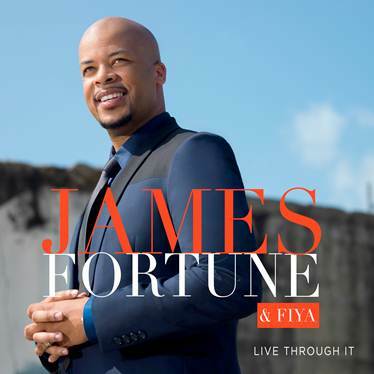 James Fortune & FIYA | Live Through It - TheUrbanMusicScene.com | Music Reviews! While music evangelists are driven by proudly proclaiming God’s goodness and dropping testimonials of being delivered through storms, they also face life’s brutal realities racked with occasional questioning of faith and doubting their relationship with God. Never minimizing the importance of praise and worship, it is sometimes those definitive make or break character development moments that hits the mark with those who avoid weekly church services. Houston, Texas-based choir director, James Fortune, and vocal group, F.I.Y.A., fully embraced testimonials and motivational teaching points when crafting songs for the radio. The story behind his unwavering attitude for God, “I Trust You” was birthed by the hardships of being homeless with his wife and F.I.Y.A. vocalist, Cheryl Fortune and their young family. “I Believe” from the 2007 release, The Transformation, emphasized that life’s problems “have an expiration date.” For those who complained about life’s daily frustrations, the answer lied in “It Could Be Worse” (Identity from 2011). A song addressing loss of loved ones and those fighting hurt, “You Survived,” was the title track of their debut in 2004 and the door opener to Fortune’s resume of trademark power ballads that have registered consistently on the gospel and urban contemporary markets. In a very busy and productive career comprising a decade, Fortune & F.I.Y.A. log in their seventh project and second live entry with Live Through It. Besides staying true to their signature motivational swagger, F.I.Y.A. attempts to stretch their musical horizons. The latter premise meets with mixed results. For the first experiment, the opening praise rouser, “Built to Last,” successfully molds their motivational swagger into a hip-hop and rock hybrid alongside rapper, Da’ T.R.U.T.H. Unfortunately, the praise flow unravels with the underwhelming techno pop of “All for Me,” though Alexis Spight’s lead vocals are extremely soulful. Continuing the F.I.Y.A. excellence of teaching platforms, the debut single and title track relays another of Fortune’s personal trails, this time centering on maturation through challenges. However, the section surrounding “Miracles” ends up a bit winded, despite the touching testimony of a cancer survivor. With a package of twenty tracks plus several reprises, Live Through It contains a fairly well paced program from Atlanta, Georgia’s, Word of Faith Church, spiced with plenty of Fortune’s always noteworthy testimonials, witnessed by several thousand passionate worshippers. Three and a half stars out of five.